Donate: Help me keep the lights on! Donations are always appreciated, large or small! 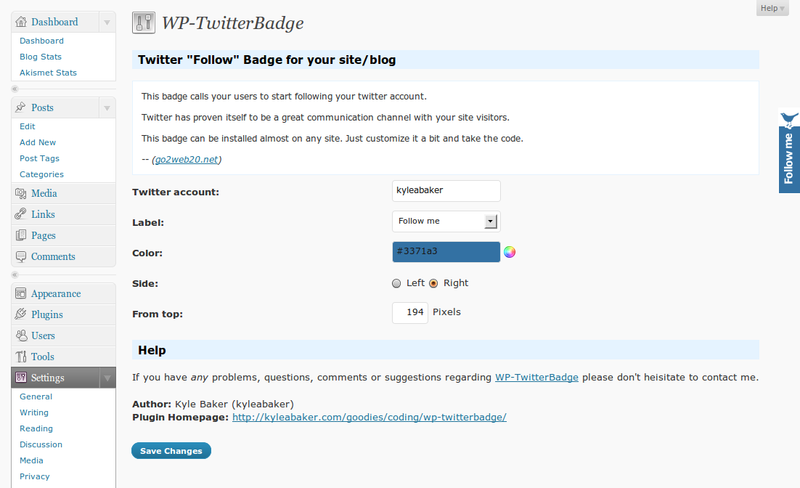 WP-TwitterBadge is a simple plugin that allows you to display a Twitter “Follow” Badge on your site or blog. It uses the Twitter “Follow” Badge that is provided by go2web20.net. This plugin takes the hassel out of having to manually edit the details and enter it into your theme each time you change themes. I’m providing this plugin as it is since this Twitter Badge is actually written and maintained by go2web20.net. However, I will be fixing bugs that are found in the plugin and updating with updates from go2web20.net. That being said, your feedback is very important! In your WordPress Admin area, click the dropdown arrow next to the Plugins menu item and click the “Add New” link. Search for “WP-TwitterBadge” and click the install button. Go to your Plugins page and click the Activate option on the newly installed WP-TwitterBadge plugin. In your WordPress Admin menu, you will find a new menu under Settings called WP-TwitterBadge. There you can choose the Twitter account to link to, label on the badge, color, side of page to display on and how far from the top to display it. Will you be taking feature suggestions? No. I am only providing this plugin with the Twitter Badge script. I did not write the Twitter Badge script that is embeded with this plugin so I cannot maintain it or add features (ethically). 😉 Sorry. I’ve found something wrong with this plugin. Where should I mention it or submit it? First of all, Thanks for using this plugin! Secondly, you can let me know about any bugs you may have found via the comments. If you have any questions, please don’t hesitate to ask me! The easiest way to ask me a question, comment or suggest something is to post it in the comments. Twitter Badge displayed links to your Twitter account to invite visitors to also follow you on Twitter! Your Twitter account name can be changed or adjusted easily via the options page if you decide to change accounts. You can customize the label on the Twitter badge with four available options. You can customize the color of the Twitter badge to any possible web safe color or use transparent so your background design shows through. You can customize the side of the page that you wish to display your Twitter Badge on. You can customize how far down the page your Twitter Badge should appear. This is a pre release to test for a fix to an Internet Explorer specific bug. Moved the preview function in the options page to the beginning fo the options code so that it is defined before each element that makes a reference to it can use it (only affected Internet Explorer). Hopefully this will solve the “Internet Explorer cannot open the internet site…Operation aborted.” issues. Finalize changes made in v0.1.1 and commit. Disable WP-TwitterBadge when the WPtouch plugin is installed and the mobile theme is being used (so the badge isn’t intrusive on mobiles). Fixed format and syntax of the readme.txt file that’s included. Fixed a bug with double slashes (//) in plugin file paths (props: morestar). Fixed a bug where the color was not auto-updated in the options page (by modifying the icolorpicker.js and added a call for the preview() function). Replaced the onkeyup event on the color textbox with an onchange event so the color is updated as you edit the field. Added tfb.path variables to hold paths to your wp-twitterbadge plugin files for wp-twitterbadge.php and wp-twitterbadge-options.php. Updated the WP-TwitterBadge Settings/Options page to be more inline with the design of WP 2.9+ (from the old WP 2.5 design). Optimized packaged images to reduce filesizes without reducing image quality. While this saves only a few extra kilobytes of bandwidth, it helps sites that are striving to perfect network performance with Page Speed for Firefox or Speed Tracer for Chrome (optimizing images). Fixed a styling bug where the about icon wasn’t using fixed positioning. Plugin is now ready to be translated by YOU! Fix issue with Microsoft Edge/Internet Explorer in cases where view port is set to device width allowing for an overlay scrollbar that covered the badge. Is there any way to get this plugin working on a WPMU site? The options.php file is different form a regular WP install. I’d love to fix any issues you’re having with the options page for the Multi-User version of WordPress, but could you be more specific? Does the options page not work at all or are there just problems with it? Terrific work, thanks. I like the color customisation feature. I’m the site admin and have full access to all directories. I was running WP V8.0 and recently upgraded to V8.1. I’m not sure if this has been tested on this level or if I am doing something wrong? I’ll look into the code to see if there are any problems there. In the meantime, could you check to see if it works in another web browser so we can see if it’s only Internet Explorer having this problem? Installed it on localhost. Activated. Trying to edit options under Firefox. This is the error message I get. Please provide more details when reporting errors. I’m unable to assist in any way without proper information. Is it WP Multi-User (or WPMU)? Optionally: A screenshot of the error? Only a small group of people seem to experience this error and without decent information about the setups being used, I am unable to properly diagnose the problem and find a solution. Now I cannot open my blog at all or the dashboard. Someone else opened it for me in another borwser and it works fine. Installs fine, configures fine… but doesn’t display with my theme (but it does work with some other themes). Not working in Firefox either. Looking forward to an update. Great plugin! Ah. Working now. Had to change the name of the folder and get rid of the version number. Didn’t get that from your installation notes! Our badge is working fine in Chrome and Firefox, but it’s dropped to the bottom of the page in IE7. Any suggestions? 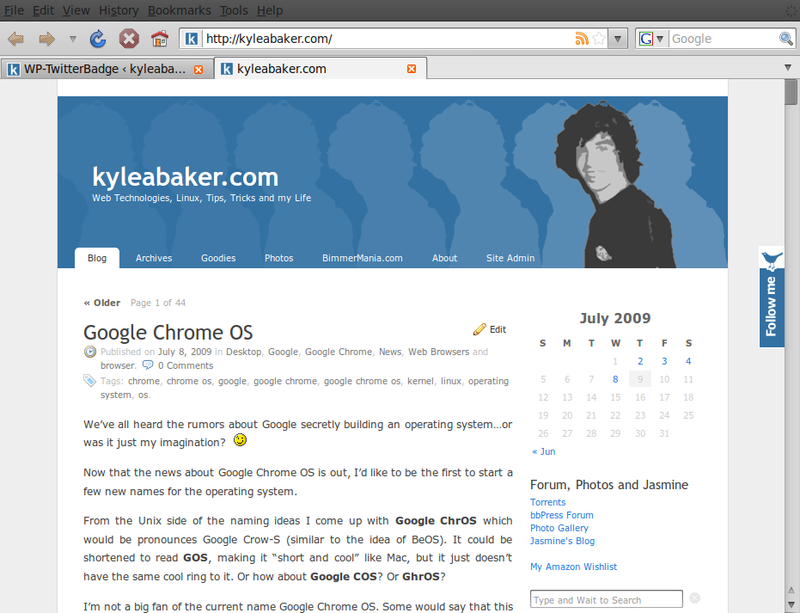 it doesn’t work with any of my client’s themes in IE7, either, unfortunately. It’s a great script though! Hello, I installed the WP-TwitterBadge ver 0.2 plugin on my wordpress site (ver 2.8.5) and the badge does not show up on my site at all on any browser. Is it the theme I’m using? Help!! I activated the plugin and adjusted a colour. Saved it but the twitterbadage is not appeared on my blog. How can I solve this problem? Everytime I activate it everything under my header disapears. Please tell me whats wrong. The slash has to be removed or it won’t display on the site. Also, I got the plugin from downloading it through my wordpress admin area. Thanks. I’ve made the appropriate changes and it should be available soon as v0.4! this plugin is exactly what I was looking for. I was getting tired of manually inserting the code at the bottom of all of my themes. And next time I switch themes I don’t have to touch it anymore. Hey the new update is making it work perfectly. Thank you, you’re awesome! WP-TwitterBadge v0.6 has just been released! I’ve been working to optimize kyleabaker.com for Google’s Speed Tracer and Firefox’s Page Speed and noticed a few images were in need of filesize optimizations. There are no code changes, but images will now load a fraction of a second faster and this will help others trying to optimize their site’s performance. Look for the update shortly! This update fixes a very minor styling bug and should be available shortly. This update adds the ability to manually specify “transparent” as your color setting to allow your page background to show through. Hey I tried to install this and I noticed that it also displays on the wordpress dashboard, which is less than ideal I’ve had to uninstall it because it hides functionality. Thanks. I’ve not seen this behavior myself, but I’ll look into it. Could you tell me which options you have displayed/enabled in dashboard? Specifically, do you have a comment view enabled or something similar? I’ve got everything enabled, comments included. also it would be great if some how we could write our own label in our own language, maybe?! Can you do this for FB and Pinterest also? Thanks Kyle. I like the badge tab style better than icons and it’s so hard to find a set to install. I have icons in place now floating on my sidebar, but I don’t like them. Would love to have a FB, Twitter, Pinterest badge…even flickr and linkedin would be extremely useful for businesses… 🙂 Thanks for considering it and I’ll keep searching until that time. Thanks Kyle! Just saw you’re from NC…I’m from SC, though I live in Bali, Indonesia! Take care! 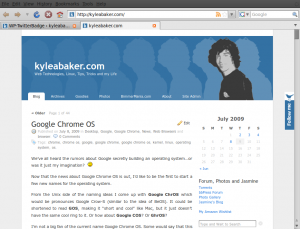 Hi, I did the automated installation but the badge is not showing in my blog. Could you help me?